One of the many facets of mission is International Disaster Response (IDR). Through the United Methodist Committee on Relief, the church is one of the first in when disaster strikes and one of the last to leave. This is true in West Mosul, Iraq, where people have been displaced, lost their homes and are facing the daily realities of living in a war zone. 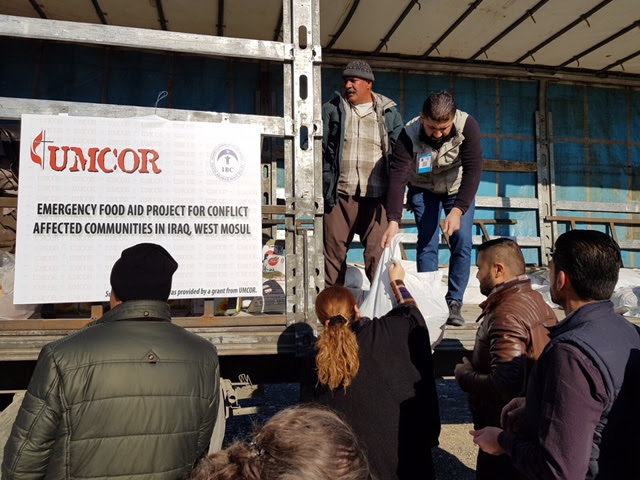 UMCOR partners with International Blue Crescent to provide food to those in need in Mosul, Iraq. One mother* shared she had lost her husband during the armed groups’ attacks of Mosul City. She now is trying to keep herself, three children and elderly father alive. She had to walk for days to get to where they currently live, and resources were difficult to locate. This mother in Mosul has received food assistance through the direct financial support provided by UMCOR to the International Blue Crescent. Imagine a world where everyone shares this kind of love and support with others. This is possible through UMCOR, which serves as the primary channel for United Methodist assistance within the United States and abroad.